I think it goes without saying that organic is better than the alternative. However, sometimes our pocket books don’t allow us to be 100% organic. I know there are those of us out there that believe spending the money up front is better than the doctor bills in the long run but we need to be practical and some people just don’t have that luxury. Lucky for all of us there’s the Dirty Dozen and the Clean Fifteen. 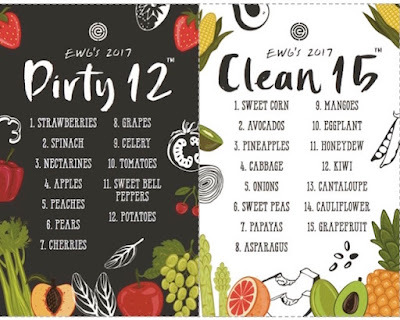 Each year the Environmental Working Group (EWG) ranks supermarket produce letting the average Joe know which fruits and vegetables are contaminated with the most pesticides and which have the fewest. Believe me people; ignorance is not always bliss … when you see that some veggies can be sprayed with 35-40 different pesticides, the hebbie jeebies going up your spine should tell you differently. The last two years, the EWG has also added a ‘Plus’ category. These vegetables don’t meet the criteria of being as dirty as the dozen but they have toxins on them that can harm your nervous system -- scary! If you are going to buy non-organic produce from the dirty dozen list, the EGW recommends peeling the skins on the items that you can, i.e. apples, cucumbers, peaches, etc. Also, eating these fruits and vegetables is still better than staying away from fruits and vegetables entirely (I’m sure there are some of you that may debate this). Buying organic will reduce your exposure to pesticides but it also sends a very important and PractiGanic message that as a consumer, you are in favor of environmental farm friendly practices that will help the land and the wildlife around the land. A great idea is to print out the picture that I have above and leave it in your wallet so you have it when you are grocery shopping.